Wort being chilled with an immersion chiller. The kettle is covered loosely with a lid. Steam from the boil sanitized the lid. I also drape clean T-shirts over the kettle while chilling to prevent airborne microorganisms moving vertically through the crack in the kettle lid. Recently, I posted an article advocating that brewers think about cleaning and sanitation as a matter of degree rather than a “good enough”/“not good enough” dichoctomy. In this article, I’ll share some ideas to move your cleaning and sanitation practices from “good enough” to just a bit better than that. For the sake of completeness, I’ll cover some familiar ground, but I think there are a couple ideas in here that are not well appreciated in the homebrewing community. When you are protecting your wort and beer from possible microbial contaminants, it pays to understand where they come from. Bacteria and wild yeast can come from unsanitary surfaces, as airborne contaminants, or from a contaminated pitch. Obviously, cleaning every surface that will contact wort or beer is a starting point for proper cleaning and sanitation. However, in many cases, a lot can be done to decrease the amount of airborne contamination in a beer. One thing to be aware of is that grain dust from pale malted grains carries a lot of bacteria. During malting, the grains are steeped repeatedly in relatively warm water to get them to germinate. The steeping water unavoidably becomes a breeding ground for bacteria. This bacteria coats the husk of the green malt and — in the case of pale malts — is not completely killed off during kilning. As such, moving your grain mill away from your brewing area will reduce the amount of airborne contamination that could later enter your chilled wort. Likewise, any spoiled grains, foods, or liquids in your brewing environment could be a “sink” of potential contaminating microorganisms. They could potentially become a source of airborne contamination, or could be transferred by contact. For example, if you touched a spot in your brewery with dried wort from a previous brewing session, then touched some tubing you were using for transferring wort, bacteria from the spot could end up in your wort. Also, if you are transferring beer, cover any open vessel. For example, if you are using a bottling bucket, cover the top with aluminum foil (which should be close enough to sanitary) or (loosely) with a sanitized lid to the bucket. Finally, you can lower the extent of airborne contamination by minimizing the amount of time chilled wort or beer is exposed (including when lightly covered by a lid, aluminum foil, or other cover). When you approach a step in your brew day that involves exposed chilled wort or beer, think ahead to what you need to do to minimize the length of this step. For example, when chilling wort with an immersion chiller, chill as quickly as possible and get the beer racked to a closed fermenter. (Note: Sometimes you may want to let the wort settle a bit before racking to the fermenter. There are always tradeoffs.) In a similar manner, before racking your beer to a bottling bucket, be sure you are completely ready to start bottling as soon as the bottling bucket is filled. Bottle as quickly as you reasonably can, but don’t rush so quickly you cause other problems. So to minimize airborne contamination, think about brewing away from sources of contamination (such as grain dust). Cover vessels of chilled wort or beer (with a sanitized cover), to lower the number of things that can “rain” from the environment into your brew. And finally, work as quickly as is feasible to move exposed wort or beer to a sealed sanitary container. Small-batch brewers who use their kitchen should also keep nearby windows and HVAC vents closed at critical moments … such as whirl-pooling, wort chilling, and racking to a fermentor or bottling bucket … to reduce the risk of air-borne contamination. 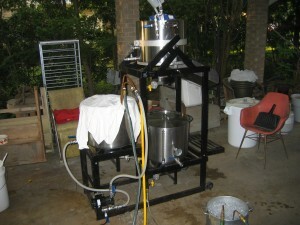 My only location where I can operate a wort chiller post-boil is on the deck outside. This has worked OK to date, but I’m always concerned about what could blow in during an unexpected wind gust. This last brew time was really nerve racking as the hummingbirds were quite heavy during a cold spell, and kept hovering near my chilling brew kettle while I was slowly stirring the cooling wort – I just /knew/ they were going to drop their ‘payload’ and score a direct hit in the kettle. Thankfully they didn’t, but it reminded me of this significantly weak link I have need of resolving in my brewing workflows before I brew again. I had a red wasp dive straight into my vorlauf once. Didn’t get it out till the kettle was drained. That became Vespidae IPA. Probably more innocuous than hummingbird dook. 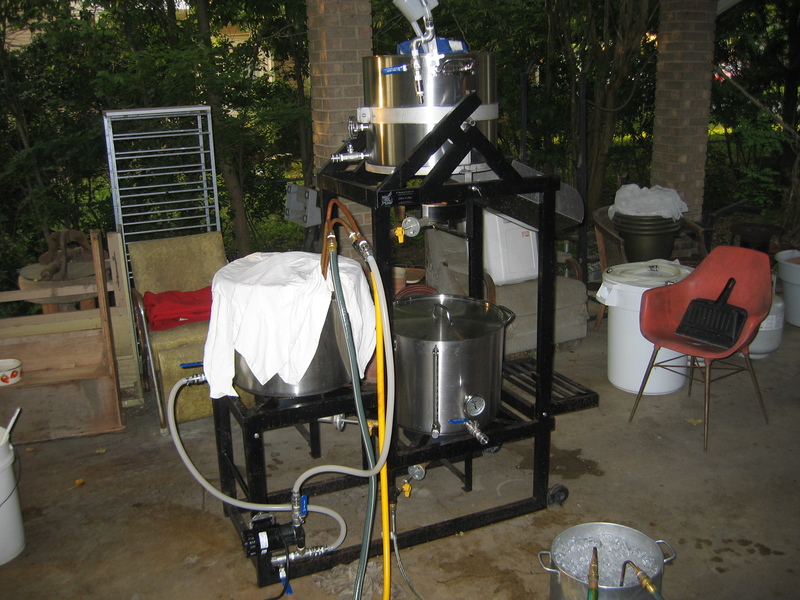 Question to Chris – how do you stir your cooling wort with the lid and t-shirt covering the pot? Do you simply remove the t-shirt and lid, give it a gentle stir, and then cover it back up?